Homemade | I love butter and sugar. One early evening this September I stepped outside, took a deep breath, and inhaled a familiar aroma that I hadn’t been acquainted with since this time last year. A feeling of excitement came over me as I continued to walk up Fifth Avenue, and I realized that this certain smell was autumn. What does that mean – to smell like autumn? It’s hard to verbalize, but it smells light, cool, and crisp, as though the air has gradually calmed down from exposure to the summer sun’s bright rays. It is redolent of the leaves changing from deep and bright greens to warm red orange and amber shades, and it is aromatic of something that is slightly toasty and nutty, yet elusive in some way. Autumn in the Northeast is completely unlike what I was used to growing up in San Francisco. A San Francisco autumn was unremarkable; the idea of leaves changing color was completely novel to me when I moved to the Boston area in 2004. I went to school at one of the most beautiful college campuses in the area and was able to fully experience a real New England autumn complete with Harry Potter-like Gothic-Georgian architecture in the background. The leaves slowly but surely changed color. I had no idea that a green leaf could turn into a deep magenta or purple shade, or that the same leaves that were orange could also become yellow before they crisped up and became brown. It was as though every day when I walked outside, I was constantly stunned by endless transformations and beauty. 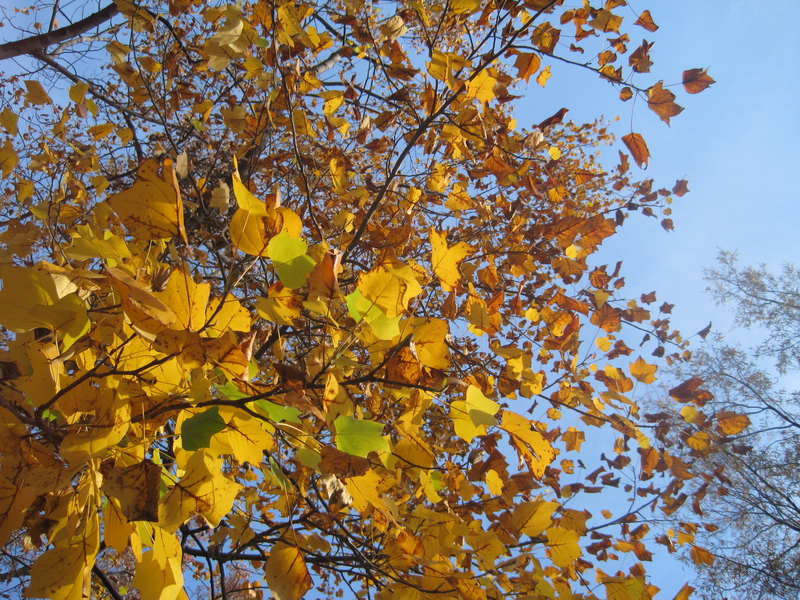 Throughout the last seven years, I’ve watched with wonder as I’ve passed children in parks embracing autumn’s arrival. The glee with which they delight in autumn has never failed to bring a smile to my face – the way they thrash around in the leaves, rolling in them, tossing them up with their hands and kicking them and crunching them. I’m honestly not sure what warms me more – seeing the kids’ carefree delight or observing the parents watch their children, realizing how amazing it is to derive joy from life’s simple pleasures. Many times, I’ve been tempted to join in on the fun and jump up and down in the leaves with them, but then the self conscious adult side of me takes over and I decide that it wouldn’t be the smartest thing to do. 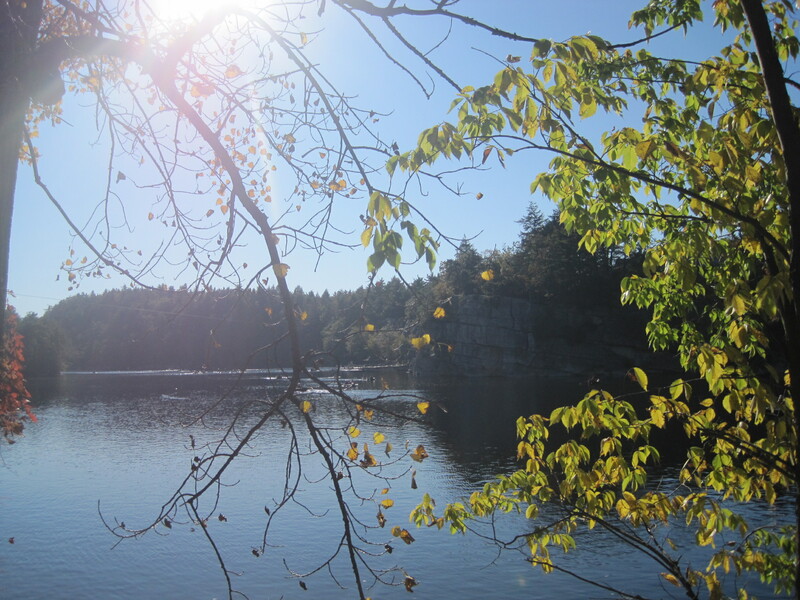 I’ve spent the last few months experiencing autumn in urban areas in New York like Union Square, Central Park, and Madison Square Park, but have also been able to see it by leaving the city and going hiking in Mohonk Preserve and wandering around the Berkshires in Massachusetts. 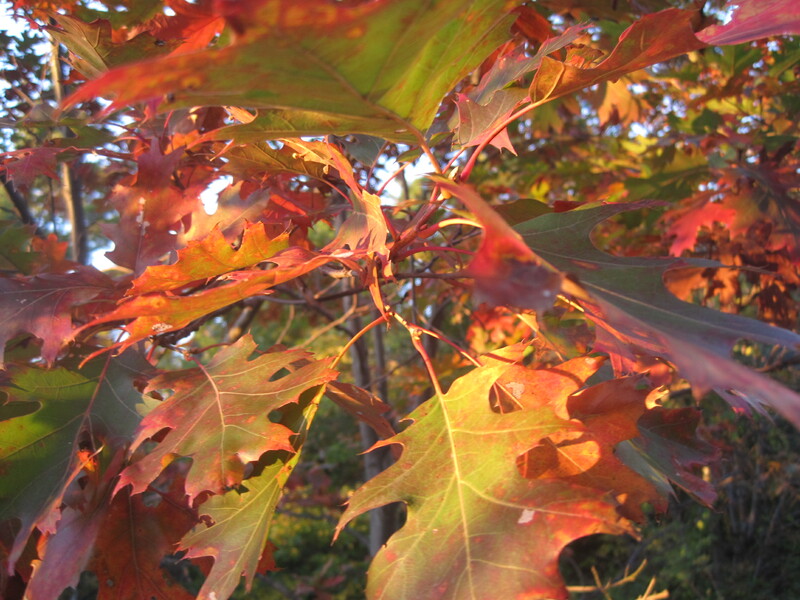 Autumn in the Northeast is the most spectacular when you are outside of the city and completely immersed in nature. The few times I have left, it’s also helped me clear my head temporarily and just think about two of the simplest yet most complex things – love and life itself. I always want to say that autumn is my favorite season, not just for that amazing smell that fills my nostrils as soon as September hits, and not just for the dramatic foliage, but also because it signifies the beginning of the holidays – Halloween, Thanksgiving, and Christmas – and the traditions I embrace each year. Carving jack-o-lanterns, cutting up different types of squash for soup, getting together with family and friends for extravagant and gluttony turkey meals, decorating Noble Fir trees with my newest and oldest Christmas ornaments, and making egg nog and holiday cookies; it’s everything I love about life condensed into three short months of the year. If we just added some sun and warmth, it really would be the most perfect time of the year (I am slightly conflicted, though, because I also love watching the snow fall and lightly dust itself onto the city around me). Autumn also means that I can get back to my favorite place in the house, the kitchen, and begin baking again. I bake the most during the autumn and winter, and one of the things I’ve been making without fail for the last four years has been pumpkin bread. The spice combination in this bread – cinnamon, nutmeg, and ginger, combined with cranberries and toasted nuts, is one of the best ways to welcome autumn back into our lives. That spicy smell wafting through my apartment just conjures up all of the memories I have of every autumn I’ve spent on the East Coast. 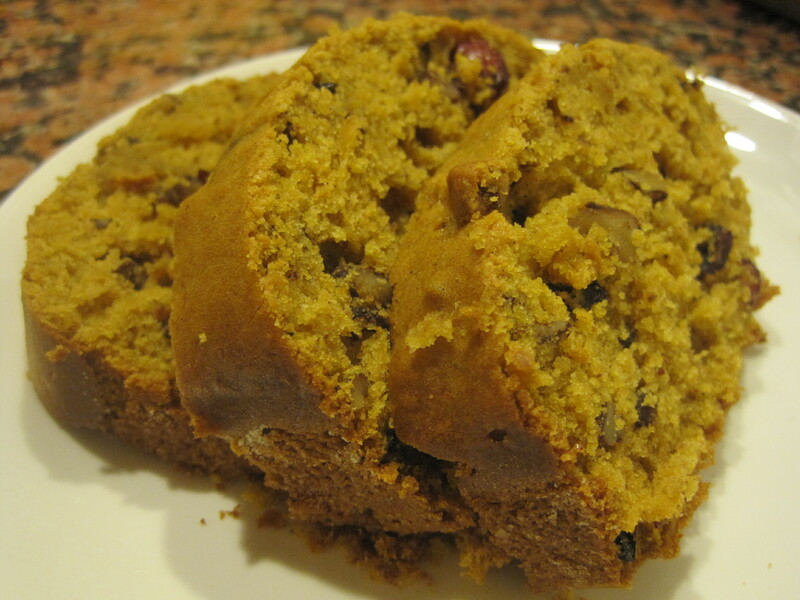 Pumpkin bread is a really simple quick bread to make. Canned, unsweetened pumpkin is readily available at almost any grocery store, and I can speak from experience when I say that cutting up, pureeing, and straining a real sugar pumpkin for your pumpkin bread or pie is not really worth the effort. The taste will be exactly the same, so you should save yourself some trouble and just buy the canned stuff. The canned stuff is really good, so there’s no reason to dismiss it. I always like to add either dried cranberries and/or toasted, chopped walnuts or pecans to my pumpkin bread. Both dried cranberries and toasted nuts always remind me of the autumn, and what’s better than making an autumn sweet bread taste even more like autumn? I got this recipe from the resident director at my dorm in college. 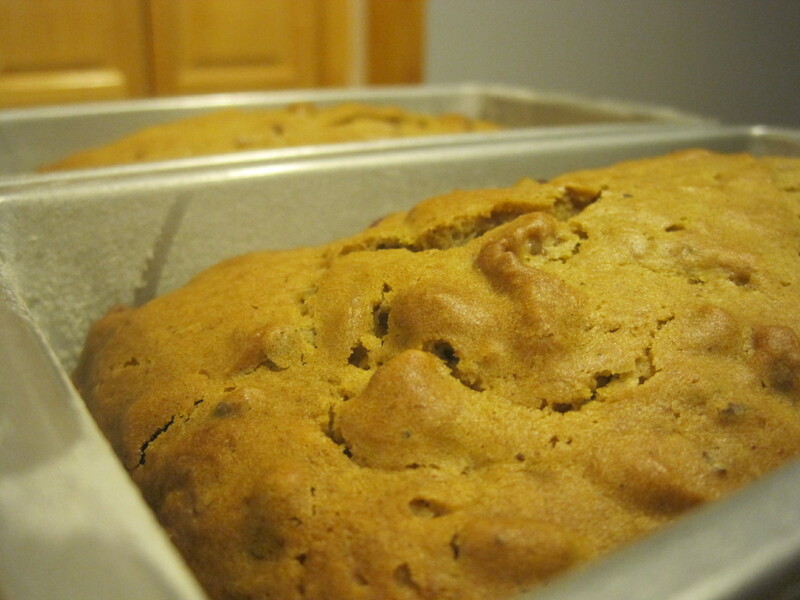 He loved to bake and cook, and in the autumn, he made several loaves of this pumpkin bread and shared it with all of us. It was love at first bite – I immediately asked if he’d be so generous as to share the recipe with me, and share he did. Although I’m no longer in touch with him, his baking legacy lives on with me and everyone else I love who gets to benefit from the fruits of my autumn baking. Combine the sugar and vegetable oil in a large mixing bowl; mix well. Add the eggs, one at a time, until incorporated. Combine the all of the dry ingredients in a medium mixing bowl. 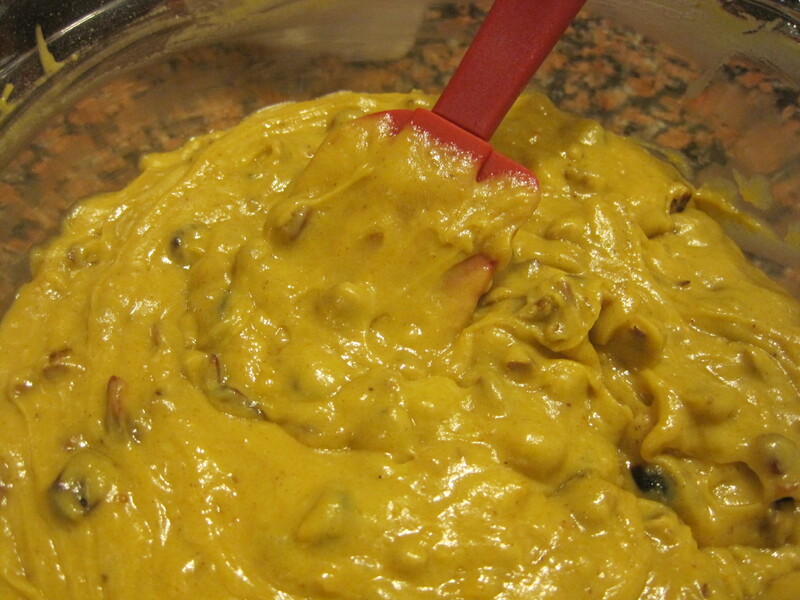 Mix the pumpkin into the egg mélange, and when combined, gradually add in all of the dry mixture. 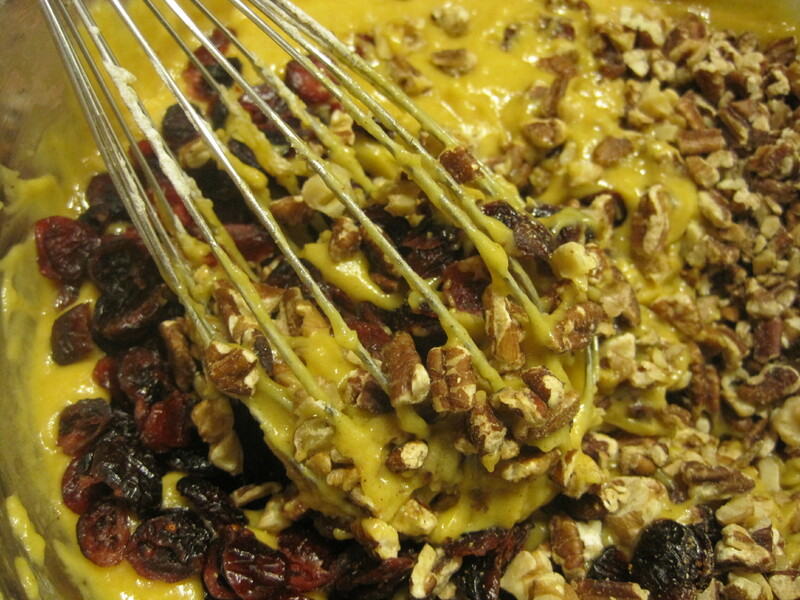 Stir in the cranberries and nuts. Put into two greased loaf pans. Bake the loaves for 1 hour. In January 2005, a friend and I went to visit the Scharffen Berger chocolate factory in Berkeley, CA, just to see what the chocolate making process was all about. Both of us were dessert and baking fanatics who love chocolate and the Bay Area, and we wanted to visit one of the many, many places that made the Bay Area known for its local goods and artisan treats. The thing that struck me the most about Scharffen Berger was that it was the very first chocolate company I’d heard of that made a point to tell you how much actual cacao, in percentage terms, there was in their chocolate (then again, I wasn’t a big foodie at the time, so I had no clue that amazing chocolate companies like Varlhona existed). Even fancier companies like Ghirardelli at that point in time didn’t tell you how much there was, and it really matters since the more cacao there is in a piece of chocolate, the more intense your chocolate experience will be. Going on the Scharffen Berger factory tour, I was completely appalled to find out that in order to legally call a piece of milk chocolate “chocolate,” the piece must have at least 10 percent cocoa solids. Yes, you read that right — just 10 percent. A question that might pop into your mind would be — if your milk chocolate bar is only 10 percent chocolate, what’s the other 90 percent consist of? Well, it’s most likely sugar, milk, cocoa butter, lecithins and other emulsifiers. Sounds like a lot of filler to me. The American FDA requirements for bittersweet, semisweet, and dark chocolate are a bit stricter, as bittersweet and semisweet must consist of at least 35 percent cacao, while dark chocolate must have at least 50 percent cacao. So for baking, I’d definitely stick with the bittersweet or dark chocolate over the milk chocolate. Chocolate is pretty complex, though, as a higher percentage of cacao will not necessarily mean better taste. As the cacao percentage increases, generally the sugar percentage will decrease. Because of this, the chocolate will obviously be less sweet, so many people who consider themselves chocolate fanatics may find a 90 percent cacao bar far too bitter for their tastes. That happened to me while I was at the Scharffen Berger factory. I realized I wasn’t a huge fan of the 85 to 90 percent chocolate bars, and so since then I’ve been tasting different percentages to see which seemed to have the best balance for baking. For me personally, I have a strong preference for at least 60 percent bittersweet chocolate to a maximum of 70 percent cacao. These will have a very prominent chocolate taste, but also have just enough sugar for balance. There are also many other considerations for what makes great chocolate, such as the process of roasting and the length of time the cacao beans should be roasted, but to simplify things for this recipe, let’s just aim for 60 to 70 percent cacao in the chocolate you use as the filling, and we’ll be good to go. My friend was the first to make these cookies, and when she presented them as a gift to me, I couldn’t stop talking about how beautiful they were and decided that I had to try making them. I wasn’t as successful as she was, though, for one big reason: I didn’t use parchment paper the first time. This is a BIG tip in the recipe that you cannot overlook when baking these — use parchment paper or a silpat. These cookies are so incredibly thin and delicate that if you just grease your cookie sheets, these cookies will not come off. They will simply stick to your pan, and the whole baking process will be a complete waste. The second time I made these (with parchment paper! ), they were a big success. They were delicate, dainty, and looked like the professional cookies in bake shops. These chocolate lace cookies are the cookies you would make when you want to dazzle someone with your baking skills. Just be patient with them when taking them off the parchment paper after baking and when sandwiching them with chocolate, and they will come out looking like you put in more effort than you really did. Another tip I have, which I already changed in my adaptation, is to use less sugar. The original recipe calls for 1 cup of sugar, which just seemed like overkill to me, so I used 1/4 less. I also decreased the amount of cinnamon from 1/2 teaspoon to 1/4 teaspoon, as I wanted the almond/oat combination along with the chocolate to shine. Try playing around with the quantities to see what suits your fancy. Preheat oven to 350 degrees F. Line baking sheets with Silpats or parchment paper. Blanch the almonds by putting them in boiling water for 3 minutes and then immediately rinsing in cold water. The skins will pop off. Dry the almonds with paper towels. In a food processor, place the almonds and pulse until coarsely chopped. Add the rolled oats. Continue pulsing until finely chopped, but not ground as finely as a powder. Melt the butter. Let it cool slightly. In a medium bowl, mix together the melted butter, sugar, egg, almond mixture, vanilla extract, salt and cinnamon. Stir to combine. Drop the batter by teaspoon onto baking sheets. Leave two inches between cookies. Bake until brown, approximately 8 minutes. Cool completely on a wire rack. In the top of a double boiler or in a bowl placed over simmering water, melt the chocolate. When the cookies are cooled, gently separate them from the Silpat or parchment and flip so the smooth side is facing up. With a spatula, gently spread each cookie with some melted chocolate. Sandwich the cookies together and serve. Finished cookies can be stored between sheets of waxed paper or foil in an airtight container for up to a week. And that was how I learned that I loved financiers. Financiers are as rich as the bankers that they were named for, simply made with ground almonds, sugar, unwhipped egg whites, flour, and a very generous amount of melted butter, which is cooked until it is golden brown. They are traditionally baked in pans that have flat rectangular molds — the reason for this was that the bakers wanted them to resemble little treasured bars of gold — but they are often baked in small boat-shaped molds, madeleine molds, as well as mini muffin pans (especially for people who are not willing to invest in a financier mold pan). My madeleine pan is at my parents’ house, and since I wasn’t willing to buy a real financier mold, I settled on making them in a mini muffin pan — not that I’m dissatisfied at all because I think they turned out quite cute. These cookies are simple, sweet, and tender, resembling mini cakes rather than cookies. Their nutty flavor comes not only from the ground almonds but especially from the browned butter. When making the browned butter, be sure to keep a close watch over it as it bubbles — aim for a golden brown that is not too dark. If you glance away for just a few seconds, your butter could easy go from brown to black. I’d also recommend using a stainless steel pot to brown the butter instead of a non-stick black bottomed pot; this way, it’s easier for you to watch the butter change color. Another thing I’d suggest is doubling the recipe — after you taste one of these, I’m sure you’ll have wished that you made more. Put the butter in a small saucepan and bring it to a boil over medium heat, swirling the pan occasionally. Allow the butter to bubble away until it turns a deep brown, but don’t turn your back on the pan – the difference between brown and black is measured in seconds. Pull the pan from the heat and keep it in a warm place. Mix the sugar and almonds together in a medium saucepan. Stir in the egg whites, place the pan over low heat, and, stirring constantly with a wooden spoon, heat the mixture until it is runny, slightly white and hot to the touch, about 2 minutes. Remove the pan from the heat and stir in the flour, then gradually mix in the melted butter. Transfer the batter to a bowl, cover with plastic wrap, pressing it against the surface of the batter to create an airtight seal, and chill for at least 1 hour. (The batter can be kept covered in the refrigerator for up to 3 days). Center a rack in the oven and preheat the oven to 400 degrees F (200 degrees C). Butter 12 rectangular financier molds (1 pan with 3-3/4 x 2 x 5/8-inch [10 x 5 x 1-1/2-cm] rectangular molds that each hold 3 tablespoons, or you can use a mini muffin pan like I did), dust the interiors with flour and tap out the excess. Place the molds on a baking sheet for easy transport. Fill each mold almost to the top with batter. Slide the molds into the oven and bake for about 12-13 minutes, or until the financiers are golden, crowned and springy to the touch. If necessary, run a blunt knife between the cookies and the sides of the pans, then turn the cookies out of their molds and allow them to cool to room temperature right side up on cooling racks. Note: Although the batter can be kept in the refrigerator for up to three days, financiers are best enjoyed the day they are baked. I’ve been perusing all of the cookie and dessert recipes that I have to pick out recipes that will allow me to put a bigger dent into the five-pound bag of almonds that I have, and I came across one cookie recipe for which I’ve often received compliments: Mexican wedding cookies. According to traditional Mexican culture, when a couple is married, each of these cookies is wrapped in brightly colored tissue paper, or papel de china, as it is called in Mexico. The cookies are then piled into baskets or cellophane bags and tied with silk ribbons. They are then passed out at the wedding dinner to guests. Although incredibly laborious in terms of the careful packaging and homemade nature of cookie baking, preparing these cookies is an old custom — one that is much loved by those who are lucky enough to receive them as treats. But who says you have to go to a Mexican wedding to enjoy these tasty delights? I’ve made them for my family and friends numerous times, and I knew that they were a winner when my uncle, who usually happily eats the cookies I’ve made for him in silence, e-mailed me shortly after I sent him away with a bag of these cookies and wrote, “What on earth are those little cookies with powdered sugar on them called? They’re amazing!” If someone writes to you to point out how great a cookie is, it must be good. So now whenever I see him and have access to baking supplies, I always make sure to bake a mini batch just for him. I originally found this recipe in a feature story written by Jacqueline Higuera McMahan in the San Francisco Chronicle several years ago. Lamenting the disappearance of old customs due to the passage of time and the modernization of today’s society, McMahan wanted to revive the tradition of making Mexican wedding cookies when her son was to marry. In her small kitchen all within one day’s time, she handmade 300 of these sweets. Three-hundred! Some of you will think it’s ridiculous to labor over something so seemingly frivolous, but I consider that an act of love. You can use either pecans or almonds to make these cookies, but I’m sure that if you use pecans, the cookie will be a bit richer because the natural fat content of pecans is a higher. McMahan uses vanilla and almond extracts as her main flavoring additions, but I’ve read that you can also use other flavored extracts or even kahlua. The recipe itself isn’t that clear regarding how to shape the cookies, so I’ll share what I usually do: I’ll take a walnut-sized (the actual shell size, not the itty nut itself! ), roll it into a ball, and then flatten it just slightly onto the cookie sheet. The sheets do not need to be greased since the butter content is very high. The resulting cookie is very crumbly, dry, and lightly sweetened by a small amount of powdered sugar in the dough as well as on the tops. These cookies are best enjoyed with a cup of coffee or tea, or as a slightly indulgent snack anytime during the day. Place the toasted nuts, 1 cup of the flour and a pinch of salt into the bowl of a food processor. Lightly grind. The nuts do not have to be really fine. The flour keeps the nuts from becoming too pasty. In the bowl of a mixer, place the butter and powdered sugar. Beat until well combined, then add the vanilla and almond extracts. Beat just to mix, and then begin adding the flour-nut mixture by 1/2 cupfuls. Blend in the remaining 1 cup flour and mix just until a dough is formed. If there are dry bits at the bottom of the bowl, use a large spoon to blend or blend with your hands. Cover the bowl with plastic wrap and chill the dough for 30 minutes. Place walnut-size pieces of dough on Silpat or a parchment-lined baking sheet. Bake for about 18 minutes, or until the edges of the cookies are golden. Cool on racks for 10 minutes. Dust a sheet of waxed paper with powdered sugar. Place the cookies on top of the sugar and sift more powdered sugar over all. Let them cool and then store in tins. Serve as is or wrap each cookie in an 8-inch square of colored tissue like red, pink, blue, yellow and purple. I’ve recently become a happy and proud recipient of a five-pound bag of California-grown almonds, courtesy of Blueberry and his much beloved Costco membership. Stores that we love and will continue to love include Trader Joe’s, Costco, and any place that sells 83 percent-plus butterfat butter/Mariage Frères tea (me) or the purest, fruitiest Italian olive oils (Blueberry). I’ve always loved almonds, particularly right after they’ve been toasted and the air is filled with a subtle, sweet, nutty aroma. They are one of the most versatile nuts for baking and pair amazingly well with almost every fruit imaginable. They are amazing whole, sliced, ground, chopped, and somehow they always look so elegant just simply on their own. It’s like they were meant to be showcased in dessert. Today I’m not really going to wow anyone with the dessert that I’ve made with a small part of that five-pound bag – I actually wanted to make something simple with just a few ingredients to allow that pure almond flavor to really shine through. The first dessert that came to mind was the old-fashioned almond cookie made the French way with only three ingredients: almonds, sugar, and egg whites. This cookie is like the French macaron’s far less fussy sister – yes, it uses ground almonds, but it doesn’t need any piping from a pastry bag, nor do the cookie drops need to rest and develop a skin before baking the way a traditional macaron would. You don’t even need an electric mixer or a whisk – just a fork to stir together the ingredients and you’d be good to go. I’ve copied the recipe below from the book, but what I actually did was I ground the almonds in a food processor, then mixed that in a bowl with the sugar, cinnamon, and egg whites. I did this because my food processor wasn’t big enough, but if you’d like, you could just follow the recipe’s directions. I also adjusted the sugar (the original recipe calls for 1 cup, but I used 2/3 cup). I found these cookies in a popular dessert book put together by Dorie Greenspan, who gallivanted all over Paris to find the most exquisite and loved desserts that the city of love (and sweets) had to offer. This recipe is from Arnaud Larher’s patisserie, where the batter is used to not only make these cookies but also to fill tartlets. Greenspan suggests either eating them au naturel or flavored with a little cinnamon, cocoa, or nuts. This time around I decided to add a half teaspoon of cinnamon to the mix, and I loved it (and so did Blueberry). They go great with coffee, tea, or just plain by themselves. This is as pure as an almond cookie can get. Position the racks to divide the oven into thirds and preheat the oven to 375°F (190°C). Line two baking sheets with parchment paper and keep them close at hand. Put the almonds and sugar in the work bowl of a food processor fitted with the metal blade and pulse, scraping down the sides of the bowl now and then, until the almonds are finely ground, about 2 minutes. If you are using cinnamon or cocoa, put it in now and pulse to blend. If you are using chopped pecans, wait to add them after all the other ingredients have been added. With the processor running, add the egg whites in a steady stream. Mix about 30 seconds, only until the egg whites are blended into the almonds and sugar— you don’t want to incorporate too much air into the batter. Add the pecans, if you are using them, and pulse just to mix. Spoon out a level tablespoon of batter for each cookie, spacing the cookies about 1 inch (2.5 cm) apart on the lined baking sheets. Slide the baking sheets into the oven and bake for 18 to 20 minutes, rotating the sheets front to back and top to bottom at the halfway point. The cookies should puff, firm, and turn lightly brown around the edges. With a wide metal spatula, carefully lift the cookies off the baking sheets and onto cooling racks to cool to room temperature. I have always loved breakfast foods — the classic American ones that include omelettes and pancakes, ethnic morning nourishments like jook (rice porridge) and freshly pressed soybean milk, and the rich, decadent ones, like a simple cafe au lait and un pain au chocolat. As the first meal of the day, breakfast should be a cherished meal, one that makes you think, “Mmm, it’s great to be alive and start the day!” It sounds corny, but I really believe it. Too often people succumb to forgetting about breakfast, insisting that they don’t need to eat before they rush out the door, or just grabbing a cereal bar (I hate these!) or a banana (well, this is better since it’s a fruit). I’m not going to lie; most times when I haven’t had enough sleep and am in a hurry to get to work, I just eat a bowl of Kashi cereal, a banana, and leave the apartment. Why would I set aside 45 minutes of precious sleep in the morning to prepare steel-cut oats? But then I stumbled upon an article in a recent issue of Gourmet magazine that raved about a cookbook that was all about the first meal of the day. In The Breakfast Book, Marion Cunningham, in her own, tantalizing way, makes a case for breakfast and why we shouldn’t forgo the most important meal of the day. She includes a large array of recipes, including quick breads and yeast breads, custards and puddings (yes, for breakfast! ), and of course, the beloved pancakes. I have tried about seven different pancake recipes from this book, and I will say now that all of them were delicious and incredibly simple. Contrary to popular belief, preparing your own pancake batter is very simple and easy, and if you prepare the batter the night before, which I’d recommend, it would even be easier than using a mix. And the taste of a pancake from a mix could never be compared to that made from scratch, but that should go without saying (no offense to those of you who are IHOP fans). Of all of the pancake recipes I tried from the book, I must say that my favorite is not terribly unique or exotic – they’re the classic buttermilk pancakes. I guess some things are classic for a reason; they have just the right tang from the sour buttermilk and are soft, fluffy, and perfect with pure maple syrup. Cunningham’s recipe doesn’t use any sugar, but I like to add about two teaspoons for a very subtle sweetness. Blueberries make these pancakes even better; I use the frozen wild Boreal blueberries from Trader Joe’s since fresh blueberries are not in season right now. The easiest way to add berries to the pancakes is to add them as the first side of the pancake is being cooked. Once you see bubbles forming on the pancake tops, lightly sprinkle the blueberries evenly on top. Another tip for the pancakes: to ensure a light and fluffy texture, do not over-mix the batter. You want to mix the wet and the dry ingredients until just incorporated. If you see lumps, you can jump up and down in giggly glee because your pancake batter is good to go. This pancake recipe is perfect for making ahead of time — it keeps in the refrigerator for days. Place the buttermilk, egg, and melted butter into a medium-sized mixing bowl. Stir briskly until the mixture is smooth and blended. Stir together the flour, salt, baking soda, and sugar into the buttermilk mixture only until the dry ingredients are moistened — remember to leave lumps, and do not over-mix. Grease the skillet lightly with butter and set to medium heat. Spoon out about 2 generous tablespoons per pancake. After about 1-2 minutes, you will see bubbles beginning to form on the pancake tops. Gently sprinkle blueberries on top of the pancakes and push down lightly. Then gently flip over with a spatula and cook the other side for about 1-2 minutes. Serve with pure maple syrup and additional blueberries.